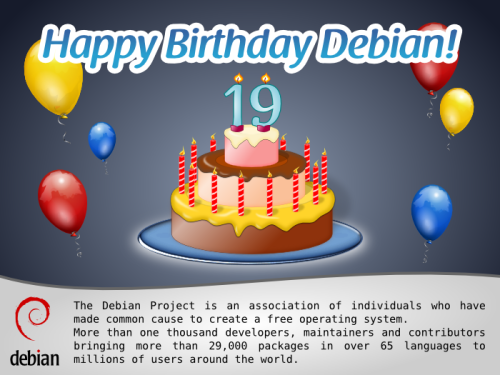 The Debian project is 19 years old now. Following Francesca's invitation (and Raphaël's lead, and using Leandro's image, collaboratively as it always happens here), I will tell a bit of my memories: How I got to Debian. I am a Debian user since ~2000, and a Debian Developer since April 2003. But, just as Raphaël's, my history must go somewhat further back in time. In 1992, I got my first 1200bps modem, and almost immediately became an avid BBS user (what's that? Javier Matuk talks [in Spanish] about BBSes in his newspaper column back in 1994). By mid 1993 I started operating my own BBS, CatarSYS. One of the key points that defined CatarSYS is that my focus was large-scale communication. I started connecting to several BBS networks, allowing messages to be relayed to distant people, mainly in the USA and Spain, and getting some feeds that could be seen as the poor man's Usenet. At some point during the year I kept CatarSYS going, I got connected through a strange set of gateways to pure gold: A UUCP feed! This means, during some months, I operated the first (free, hobbyist) service that offered its users a free Internet mail address in Mexico. Yes, it was completely different to what we are used to today. I tried to connect to my provider at least three times a week, but this meant less than one week turnover time for messages sent to people anywhere in the world! But, back to Debian: Via this UUCP feed, I also got some real Usenet newsgroups — Including several on the comp.os category. I remember reading about Linux back then, and learning some commands, but didn't really get hooked into it. I was in Israel from July 1994 to June 1995, doing completely non-computer-related tasks. Came back in 1995, and due to my father being an academic, got dialup internet access at home. WOW, *real* Internet! It didn't take me long to start downloading Linux information and floppy images. One failed after another. But before the end of the year, I found in a bookshop a book (that included a CD-ROM) called "Build your own web server with Linux". WOW again — Remember this was still 1995! I bought it, and shortly afterwards, I had a Slackware system (Linux kernel 1.0.9) running. That meant many sleepless nights full of joy and frustration (as getting hardware to work was cloe to impossible). By 1996, I got (within one week) my two first real jobs: A systems administrator at a small ISP and a highschool teacher. At the ISP, I got a spare computer to play with Linux, as –of course– the Big Server was running with Windows NT 3.51. Poor little machine... By then I was already a part of the Mexican Linux User Group. This group had just printed a batch of Linux CDs — RedHat 4.0. This was the first release that really made me happy and allowed me to do good work. Together with a friend I took to work with us, Juan Pablo Romero, we installed over a weekend a full replacement for our buggy NT machine, in much cheaper hardware. Of course, Linux was nowhere near corporate-recognition, and our project remained a project, not touching the Windows machine. Anyway... Several years passed, and I was happy with my RedHat choice. I won't mention the milestones and job changes, as it would get boring and leave the point completely aside. By the year 2000, I was quite more involved with the LUG, as well as with the computer security group in DGSCA-UNAM. I became also an OpenBSD user, and had got so hooked up in free software that I felt the need to collaborate: To be a little part of one of those Big Projects that had given me so much. But which one? I have never been much of a programmer — Yes, I can solve my everyday needs and have fun with it, and sometimes a bit beyond that. I enjoy programming. But all of my projects have begun little… and stayed little. I wanted to join OpenBSD, as it was a community I really believed in, but given my skillset (and given a flame-prone, aggressive developer community), I lost motivation to do so. By 2000, I had also lost faith in RedHat. I don't have the exact dates, so I might be some months off — But after RedHat's IPO, I felt a sharp change. Version 7.0 was really demotivating — It tried to offer a polished desktop experience, but was really buggy, unstable, and full of bad decisions. In Mexico, Pepe Neif had taken up the job of making a derivative distribution of RedHat (called LinuxPPP), pressing hundreds of CDs and making a teaching program I was part of several times. Talking with Pepe (who continued to release based on RedHat 6), he told me he was interested in switching over to become a Debian-based distribution, but the job of migrating his installed base made the project stall — LinuxPPP reached only version 6.4. But I installed Debian in early 2000, and loved it. I started getting familiar with its social philosophy and foundation documents at the same time I started migrating my servers from RedHat to Debian — This must have been by Spring 2000, as I installed Potato while it was frozen but not yet stable. By January 2002 I applied for NM. My process took a long time, as my AM got MIA when he had already approved me (but before sending the AM report), so basically I had to go through AM twice — And by April 16, 2003, I got accepted as a DD. Contrary to what is acceptable today, I requested the full process to be done before starting to maintain any packages, as I didn't want to bother people with package sponsorship requests, so my whole process was done evaluating packages I would eventually upload. Since becoming a DD, my main involvement in the project has been in packaging groups (I was a pkg-perl founder and member for many years, and am currently working in the pkg-ruby-extras group). But, as I said, my main strength is not programming — So my main involvement in Debian has been more social than technical: I have been a DebConf organizer since 2005, a very interesting, stressing, rewarding and (for some months) time-demanding role, and since 2009 I am part of the keyring maintainence team, which is much easier workload, although carries important ramifications. So, after 19 years of Debian, and after nine years of me being part of it, Debian is clearly my strongest link to the Free Software community, a project I have grown to love and whose way of being I share and enjoy studying and explaining. And it is a technically excellent product, and a great place to start and keep learning both about how every aspect and layer of an operating system works, and how human-to-human interaction works in such a diverse, almost impossible environment happens.